I know what you're thinking. Why in the world would I be writing about music on a video game blog? I find the concept to be extremely interesting, and I'm curious to observe more specific uses of gamification as it becomes increasingly prevalent as a strategy, but I think it's important to consider the potential drawbacks of gamification. 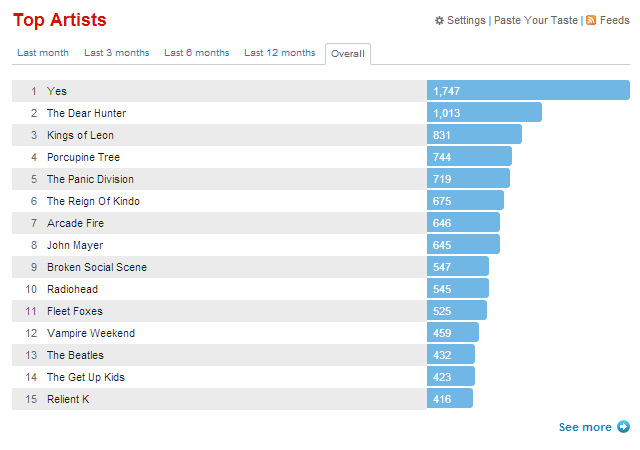 One of my favorite gamifications of an everyday task is last.fm. While it isn't a game in the strictest sense, I found there to be something game-like about last.fm observing and tabulating my music listening habits. Perhaps I should say that it "was" one of my favorites. I've since found a way to tear myself away from the site, and it has been wonderful. I'm getting a little ahead of myself, though. Let's go back to the beginning, and I'll tell you a tale of woe. I'll tell you all about how I began my relationship with last.fm. I signed up for last.fm on Janaury 25, 2006 and installed the scrobbler on my computer. This application would run quietly in the background and count every song that I listened to in iTunes (as well as any iDevice that I synced up). I thought it would be intriguing to see what sort of listening trends I could derive from the data that I was sending up to my profile, and as of today, last.fm has tracked 41359 plays over the life of my membership, a high score that reflected my eclectic tastes in music. I could see how many times I had listened to a particular artist or song, which was fascinating. The problem was that it became too fascinating. I started going out of my way to make sure that any music I listened to was being counted and analyzed. I stopped listening to music on CD and avoided any online streaming service that didn't have an option to scrobble to last.fm. When I finally caught myself, I laughed, but then I realized that I had a problem. Last.fm was controlling my music listening experience, and obsessing over all of this meta-data was seriously detracting from the true purpose of the listening. I wasn't enjoying it the way that it was meant to be enjoyed. I couldn't pull the plug, though. I was addicted, which must be the objective of any gamified service. As is clearly supported by my score of 1747, Yes is my favorite band of all time. On a whim, I picked up a couple of my favorite of their albums, Fragile and Close to the Edge, on vinyl a few years ago. Of course, I had no way of listening to them. But when the Dear Hunter (my second most-listened-to band on last.fm) announced that they were releasing an ambitious series of color-themed EPs exclusively on vinyl, I officially became a collector. 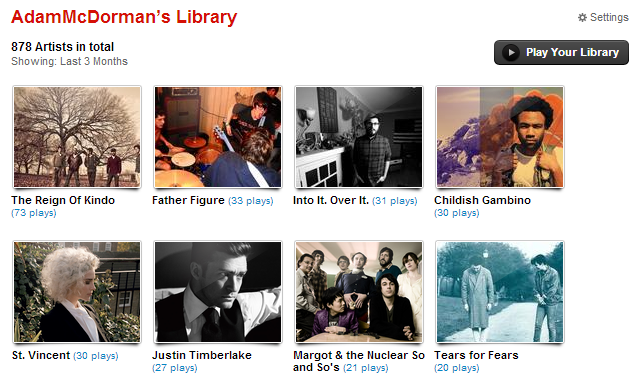 Though I didn't immediately stop using last.fm, this was the first serious blow against my scrobbling addiction. Over the years, collecting and listening to vinyl records has grown from a novelty into a major part of my listening experience. I love putting on a record and displaying the album sleeve prominently atop my turntable. I've acquired a bizarre array of vinyl LPs that does just as good a job of reflecting my eclectic tastes in music as my last.fm profile did. In fact, yesterday, I purchased my 150th album—a not so great copy of Abbey Road by the Beatles. I've also just recently completed a 10-part video series on my YouTube channel in which I shared my entire vinyl collection. Meanwhile, as I finish writing this blog post, I've also permanently deleted my last.fm account. Go ahead and check last.fm/user/AdamMcDorman to see a whole lot of nothing (assuming that the other Adam McDorman doesn't claim the account). It's gone for good, deleted into oblivion. To be quite honest, I felt no hesitation about putting an end to the counting. I no longer feel bound to a single medium, which means that I can listen to music whenever and however I want. It is truly a wonderful thing. Gamification can be a wonderful way to motivate yourself to do something, but make sure that the game doesn't begin to detract from the real purpose of your pursuit.